Engage with What You Love – Love. Life. Practice. Even if you can’t watch it, you can tell from the screen shot that this is a conductor who is engaged in what she is doing. Even people who don’t like classical music tend to smile as they watch her conducting, because she is fully present with her entire body – and that’s just in rehearsal. 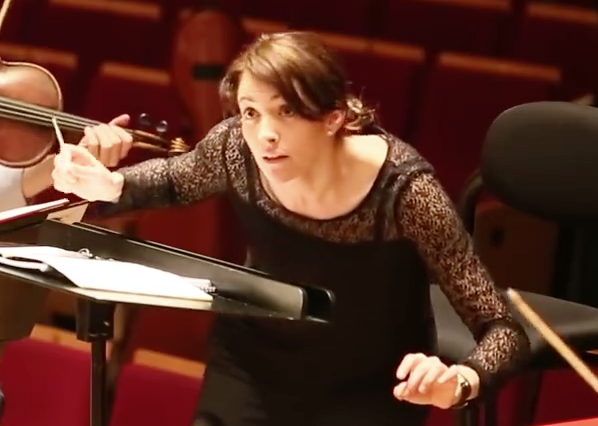 Good conductors are like that; even if they don’t get quite as full-range-of-motion as Alondra de la Parra, it’s because they’ve taken all the energy in their body and put it into their pointer finger, or their wrist, or their elbows (seriously, it seems like every conductor needs to pick a body part that is the point of motion and the rest of their body just kind of flails along). But not all conductors are good; some just sit up there with “dignity” steadily counting a beat and cuing their musicians. That can be effective, but it isn’t engaging, and frankly it’s pretty boring for everyone concerned. It also has a distinct advantage in the performing arts, at least: passion trumps talent. In high school I played in the rhythm section of a couple of the jazz bands – percussion (not drum set) and piano. Thing is, I was not a very good piano player – relying on basic lessons from when I was 8 years old, faking my way through chords and only having the vaguest idea of scales. Still, I really enjoyed the music – possibly because my first performance was at the end of a week of band camp, playing the piano part of the Blues Brother’s theme on a 12-foot grand piano. That can make an impression on a guy, and I loved when I got to sit in at the Rhodes electric piano for symphonic jazz band. I was confused, but I nodded. We both knew that was true; it had always been true. “So why are you mad?” I asked, still a little worried. She looked like she either wanted to cry or to slap me. Lesson being: if you perform all the notes but don’t play them (or maybe vice versa) the song and the music will suffer. A good friend of mine who runs dance workshops in San Francisco was asked to be a performer at an event featuring pole dancers. (Side note: if you are one of those who believes that pole dancing is a sordid and decadent art form solely for exotic dancers, I will remind you that ballet began in the court of Louis XIII and was described as “part burlesque, part acrobatics, filled with outlandish obscenities.” Art is about intent, not content). She is not actually trained in pole work, and as she watched other trained teachers and professional competitors do amazing things on the pole, she started feeling a bit out of place. Lesson being: what does it benefits a dancer if they learn all the right moves but lose their own dance? The thing is, I don’t think that it’s limited to the arts. I think it’s part of just about anything that you do: if you do it with full engagement, you will do it better. People are drawn to passionate action, and it’s the place where you can find your own flow. If you haven’t got any idea what that’s like…then I really suggest you start looking, because you’re cheating yourself out of one of the best pleasures of life. It doesn’t have to be a 12-foot grand piano or a steel pole – it could be a game of Minecraft or a well-cooked meal or an authentic letter to a friend. Find it. It’s worth it. And let me know what it is!